Capterra, a business software solution review site, has named DSS (Dynamic Self-Syndication) in its list of the Top 20 Most Popular Content Management Platforms. 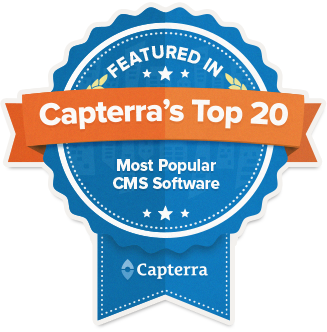 "Capterra's inaugural Top 20 Most Popular Content Management Software report ranks CMS systems on a multitude of factors," said Liz Gujral of Capterra, a web CMS research and review site. "DSS, made by Foster Web Marketing, ranked in our report because of an impressive social following, particularly on Facebook." Recently, DSS also made the 2017 list of Best Marketing Automation Software and has been ranked as a “High Performer” in G2 Crowd’s list of Best Marketing Automation Software. We are honored to receive such high praise and thrilled to see that DSS is getting the credit it deserves. We created DSS to be your all-in-one marketing automation system. It allows users to add content to their site at any time; create, schedule, and send marketing emails; create forms and offer pages; track and manage leads; upload videos and push them directly to YouTube, and it provides analytics for each page of your site. We’ve worked hard to make DSS your one-stop shop for all digital marketing functions, and we will continue to provide new features and follow best practices. Because our users gave us such great reviews, we are able to compete with some of the biggest names in the business. See what our clients have to say about DSS here. According to our users, DSS is easier to use than Hubspot, WordPress, and Infusionsoft. We really aim to give you the best an all-in-one marketing system. There’s no need for plug-ins that could slow your site down or may not be compatible with your software; we provide all of the solutions you need in one place. This means you communicate with one team who knows the ins-and-outs of your site, rather than speaking to multiple outside companies across several platforms just to complete simple tasks. Still not convinced? You can see how DSS compares to some of the biggest names in the business here. DSS has everything you need to market your business online successfully, but it has more than just features. It also provides insight into everything you are doing. By providing page-level performance reporting, lead and email tracking, built-in follow-up campaigns, and social media performance reporting, you can see what is working and what is not, so you can continually improve and see better results. We also provide monthly DSS Users’ Groups for our clients where we discuss new features, best practices, and marketing strategies. Ready to see what DSS can do for you? Learn about the features in DSS and register for a one-on-one demo here.